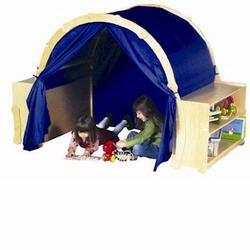 You get three units in one with this unique storage, dramatic-play, and quiet time structure. Each of the 2 bookshelves provides ample storage for books, games and puzzles. The play hut features canopy and front and rear curtains. Kids can create their own house, market, theater stage, or quiet space for reading, drawing or napping.Oversized container -- Additional shipping charges apply.